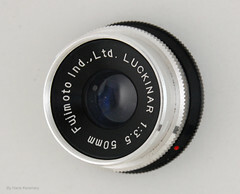 Fujimoto is a Japanese company that made cameras at some time and currently (2007) makes enlargers and other equipment. Fujimoto was founded in Osaka in 1913 by Fujimoto Tōjirō (藤本藤次郎) to make photogravure equipment. In 1933, it established as Gōshi-gaisha Fujimoto Seisakusho (㈾藤本製作所, meaning Fujimoto Mfg. Co.) and opened a plant in Osaka, Minami-ku Nagahoribashi-suji 2–8 (大阪市南区長堀橋筋二丁目八). It perhaps began to manufacture cameras around that time. In late 1934, it released the Semi Prince (the earliest Japanese 4.5×6cm camera), distributed by Fukada Shōkai. This camera was advertised as "made by Prince Camera Works", certainly a mere dummy name used by Fukada for advertising purpose (see Camera Works). The other cameras called Prince and associated to "Prince Camera Works" are sometimes attributed to Fujimoto, but this is unconfirmed. In 1935, the production of enlargers began under the brand Lucky and it still continues today (2007). The first enlargers were developed by Takahashi Kenzō (高橋健三), who had entered the company in 1934 and would become its CEO after the war. In September 1937, Fujimoto bought all the assets of the company Neumann & Heilemann, including the trademarks and the plant near the Mukogawa (武庫川) river, which became the company's Mukogawa plant, reportedly called Mukogawa Shashin Kōgyō (武庫川写真工業, meaning Mukogawa Photo Industries). Fujimoto took over the production of the Rulex and Perfekt shutters and Prince Flex TLR camera, and the assembly of the Radionar lenses. The NH logo and "Neumann & Heilemann" markings were kept on all these products, and it is not possible to identify for sure those which were made after the takeover by Fujimoto. The Semi Lucky, produced from 1937 in the Mukogawa plant, was the first camera sold by the company under its own brand. In 1940, Fujimoto began to make its own Rapidex leaf shutter, produced in the same Mukogawa plant and mounted on the Semi Sport. The Rapidex shutter displays the logo of the company, formed by the letters FT arranged as a circle — FT are the initials of the founder Fujimoto Tōjirō (藤本藤次郎). Fujimoto also made a larger leaf shutter called Sport, sold to various other camera makers. In 1943, Fujimoto established a new plant together with Kashimura Yōkō and Tomioka Kōgaku in the Manchurian city of Dalian, under the name Kantō Kōgaku Kōgyō K.K. (関東光学工業㈱). Plans were drawn to move the production of enlargers and cameras there, with almost no result. Because of this, the Mukogawa plant was handed over to Chiyoda Kōgaku Seikō (predecessor of Minolta), and became Chiyoda's Nishinomiya plant. The production of the Rapidex shutter was perhaps taken over by Chiyoda at the time. All activity stopped in 1945. 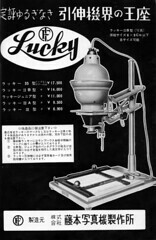 In 1949 the Semi Sport and Lucky enlargers were advertised by a company called Nippon Kōki Kōgyō, whose relationship with Fujimoto is unknown. In 1950 the company was revived as Fujimoto Shashinki Seisakusho (藤本写真機製作所, meaning Fujimoto Camera Mfg. Co.) by Takahashi Kenzō. It made a camera called Luck during a short time and also used the name Fujimoto Camera Works (藤本カメラワークス) for advertising before dropping camera production. At the beginning, the products were distributed by Kashimura Yōkō, which was still mentioned as authorized dealer for Kantō (Eastern Japan) in 1954–5. The authorized dealer for Kansai (Western Japan) in 1955 was K.K. Efuti Shōkai (㈱エフテイ商会, probably a transcription for FT Shōkai), perhaps a dependent company of Fujimoto; its address was Minami-ku Minami-Watayamachi 18 (南区南綿屋町18) in Osaka. The company was incorporated again in 1952 as K.K. Fujimoto Shashinki Seisakusho (㈱藤本写真機製作所) and the plant was moved to a new location in Osaka, Higashi-sumiyoshi-ku Kuwazu-chō (大阪市東住吉区桑津町). Fujimoto advertisements dated 1955 say that fake Lucky IIB enlargers were offered on the market, and warn the customers to buy only genuine Lucky enlargers, showing the FT logo and the model name in Roman script, and sold with a warranty card. In 1960, the main address was Yao-shi Kyūhōji 2204 (八尾市久宝寺2204) in Osaka. In 1966 the company became Fujimoto Shashin Kōgyō K.K. (藤本写真工業㈱, officially translated as Fujimoto Photo Industrial Co., Ltd.). In 1984, Takahashi Kenzō became senior advisor (相談役) and Takahashi Hideo (高橋英夫) became the new CEO. The company was still independent in 2007. It was absorbed into Kenko on December 27, 2007, and has become the Fujimoto photo activities department (藤本写真事業部) of Kenko Co., Ltd., making lab systems, enlargers and slide projectors. Sport shutter (1–300, B, T) on a New Semi Condor. Early Lucky enlargers were reportedly sold c.1936 with Schneider Vergr. 105mm f/4.5 lenses. Early enlarging lenses marked Lucky Vergr. Anastigmat are known too. ↑ 1.0 1.1 1.2 1.3 1.4 1.5 1.6 1.7 1.8 Fujimoto official history. ↑ The exact address was Ōsaka-shi Minami-ku Nagahoribashi-suji 2–8 (大阪市南区長堀橋筋二丁目八). Source: advertisement dated December 1935 reproduced in Tanimura, p.51 of Kurashikku Kamera Senka no.11, advertisements dated 1937 to 1942 reproduced in Kokusan kamera no rekishi, pp.76 and 102, and "Kokusan shashinki no genjōchōsa" ("Inquiry into Japanese cameras"). For some reason, Tanimura, p.50 of Kurashikku Kamera Senka no.11, says Minami-ku Hachiman-suji-ura (南区八幡筋裏). ↑ The earliest advertisement for the Semi Prince was in the November 1934 issue of Asahi Camera. It is reproduced in Tanimura, p.50 of Kurashikku Kamera Senka no.11. ↑ Attribution to Fujimoto: see for example Sugiyama, items 1227 and 1233, and McKeown, p.331–2. ↑ 5.0 5.1 5.2 5.3 Tanimura, p.51 of Kurashikku Kamera Senka no.11. ↑ Tanimura, p.99 of Kurashikku Kamera Senka no.12, and p.51 of Kurashikku Kamera Senka no.11 (note 2). ↑ FT initials of Fujimoto Tōjirō: Tanimura, p.51 of Kurashikku Kamera Senka no.11. ↑ Sport made by Fujimoto: "Kokusan shashinki no genjōchōsa" ("Inquiry into Japanese cameras"), shutter item 24-Q-2. ↑ Tanimura, p.99 of Kurashikku Kamera Senka no.12. ↑ The Rapidex is attributed to Chiyoda, predecessor of Minolta, in the 1943 government inquiry, perhaps for that reason. Source: "Kokusan shashinki no genjōchōsa" ("Inquiry into Japanese cameras"), shutter item 18-P-27. ↑ Advertisement reproduced in Kokusan kamera no rekishi, p.143. ↑ McKeown, pp.331–2, lists "Fujimoto Camera Works" and "Fujimoto Mfg. Co." as two different companies, but this is a mistake. ↑ Fujimoto Camera Works: advertisement reproduced in Kokusan kamera no rekishi, p.205. 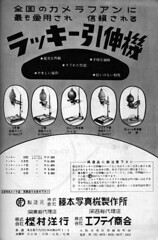 ↑ Advertisements dated 1952 and 1954 reproduced in Kokusan kamera no rekishi, pp.125 and 205; advertisement in the October 1955 special issue of Photo Art, p.154. ↑ Advertisement in the October 1955 special issue of Photo Art, p.154. ↑ Advertisements in the October and November 1955 special issues of Photo Art, reproduced in this page. ↑ Advertisement in Asahi Camera Annual '60. ↑ See for example this Web archive version (18 August 2007) of the Fujimoto official website. ↑ Press release on the Kenko website. ↑ Column in Asahi Camera March 1936, p.455. ↑ Lucky Vergr. Anastigmat 5cm f/4.5 pictured in this page by Akiyama Michio (pictures captioned "Cine Nikkor Lenses" and "Nikkor 12cm F4.5 No. 3193"). Asahi Camera March 1936. "Atarashii kikai to zairyō" (新しい機械と材料, New equipment and machinery). P.455. Asahi Camera Annual '60 (アサヒカメラ年鑑'60). Tokyo: Asahi Shinbun-sha. No ISBN number. Advertisement by Fujimoto Shashinki Seisakusho. Photo Art rinji zōkan: Kamera no chishiki (フォトアート臨時増刊・カメラの知識, Photo Art special issue: Knowledge of cameras). October 1955, no.87 of the magazine. Advertisement by Fujimoto Shashinki Seisakusho, p.154. Photo Art rinji zōkan: Saishin supuringu kamera zensho (フォトアート臨時増刊・最新スプリングカメラ全書, Photo Art special issue: All the latest folding cameras). November 1955, no.89 of the magazine. Advertisement by Fujimoto Shashinki Seisakusho, p.22. Kawamata Masataku (川又正卓). "Semi Prince — Luck." In Supuringu kamera de ikou: Zen 69 kishu no shōkai to tsukaikata (スプリングカメラでいこう: 全69機種の紹介と使い方, Let's try spring cameras: The use of and actual examples from 69 machines). Tokyo: Shashinkogyo Syuppan-sha, 2004. ISBN 4-87956-072-3. Pp.78–80. McKeown, James M. and Joan C. McKeown's Price Guide to Antique and Classic Cameras, 12th Edition, 2005-2006. USA, Centennial Photo Service, 2004. ISBN 0-931838-40-1 (hardcover). ISBN 0-931838-41-X (softcover). Pp.331–2, 572. Tanimura Yoshihiko (谷村吉彦). "Neumann & Heilemann: kieta ashiato, Minoruta setsuritsu to sono ato no karera wo otte" (Neumann & Heilemann 消えた足跡・ミノルタ設立とその後の彼等を追って, On the traces of Neumann & Heilemann at the founding of Minolta and afterwards.) Kamera Rebyū: Kurashikku Kamera Senka (カメラレビュー クラシックカメラ専科) / Camera Review: All about Historical Cameras no.12, October 1988. No ISBN number. Minoruta kamera no subete (ミノルタカメラのすべて, special issue on Minolta). Pp.96–9. Tanimura Yoshihiko (谷村吉彦). "Semi Purinsu kara Rakku made — Takahashi Kenzō shi ni kiku." (セミプリンスからラックまで・高橋健三氏にきく, "From the Semi Prince to the Luck — Asking Takahashi Kenzō") Kamera Rebyū: Kurashikku Kamera Senka (カメラレビュー クラシックカメラ専科) / Camera Review: All about Historical Cameras no.11, March 1988. No ISBN number. Shirarezaru kamera (知られざるカメラ, special issue on unknown cameras). Pp.50–1. Based on an interview of Takahashi Kenzō, former CEO of Fujimoto, who entered the company in 1934. This page was last edited on 16 January 2019, at 19:37.